A real-time strategy game set in World War II, Company of Heroes brings to life, in full cinematic detail, the greatest war mankind has ever known. 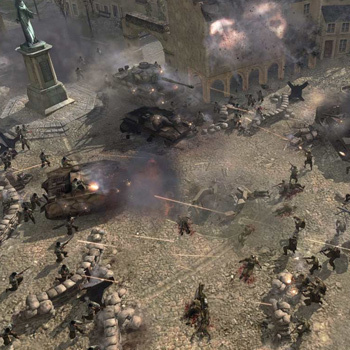 Company of Heroes is built on Relic's next-generation Essence Engine and also utilizes the Havok Physics engine, delivering cinematic visual detail in a world completely driven by realistic physics. Gamers will experience the journey of the brave men of Able Company in a deep single-player campaign that begins with the invasion of Normandy through their fight across Europe, all set against the most dynamic battlefield ever seen in a game. Company of Heroes' completely destructable environment means no two battles ever play out in the same way. Advanced squad AI delivers startling new realism and responsiveness, bringing soldiers to life as they interact with the environment and execute advanced squad tactics to eliminate the opposition forces.